Just to make it clear from the beginning, I SELL WINE, and I use this blog to write, promote and sell wines (imported by me or by some friends - call it the Wine Mafia...) that are original, unique, engaging and extreme, and that are available to the Irish market in such limited quantities that it would be virtually impossible to find them in shops and restaurants around the country. Here you will also find recipes, the odd restaurant review and various and variegated personal thoughts. Friends in excess of happiness sometimes are more intense and difficult to handle than friends in a depressive or miserable mood. But friends in excess of happiness can also surprise you in some unexpected ways. And if the happy friend in a celebratory mood has access to a well stocked cellar, things can get very interesting. That's how I came across a bottle of Puligny-Montrachet 1er Cru "Les Pucelles" 2004 Domaine Leflaive. 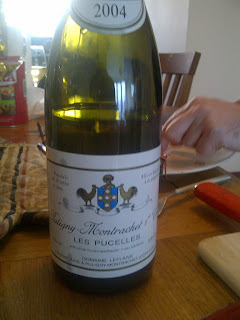 Difficult to find words to describe it: it was broad, intense, massive, but at the same time mineral, fresh, elegant. The palate had direction and definition, with a toasty, nutty creaminess perfectly balanced by a citrussy acidity. It had everything and its opposite, and it all made sense. Glorious. There are lot of beautiful red wines around, cheap, expensive and anything in between. Cheap and lovely in white wines is less common, but when you cross path with a great white wine, you can reach some peaks that you wouldn't imagine. And there's no red wine that can compete. Domaine Leflaive (not to be confused with Olivier Leflaive) produces produces probably the best white wines in Burgundy, and that's as much as I will say as you can find loads of stuff about them if you do a quick search on internet. It's not a cheap wine; I suppose if you can find some it will be probably on the €150-180 mark per bottle, probably even more. But trust me, it is worth every penny.